With over 8 million daily active users, Slack has become a big part of tens of thousands of teams’ lives — making it faster and easier than ever to communicate and collaborate with colleagues. Since we want to help you integrate Stackla into your daily workflows and we understand that Slack is now an integral part of many of your day-to-day working lives (it is for us too! ), we created our new Slack integration. With Stackla’s new Slack integration, you and your team can receive real-time notifications and take direct action on newly rights approved content without ever having to leave your Slack App. When a content creator approves your user-generated content (UGC) rights request, our Slack integration sends a notification to the Slack channel(s) of your choice. You’ll see the posted media, caption, network and current moderation status right there in the message. When a rights request is approved by the content creator, the image or video is sent directly to your Stackla Asset Manager. 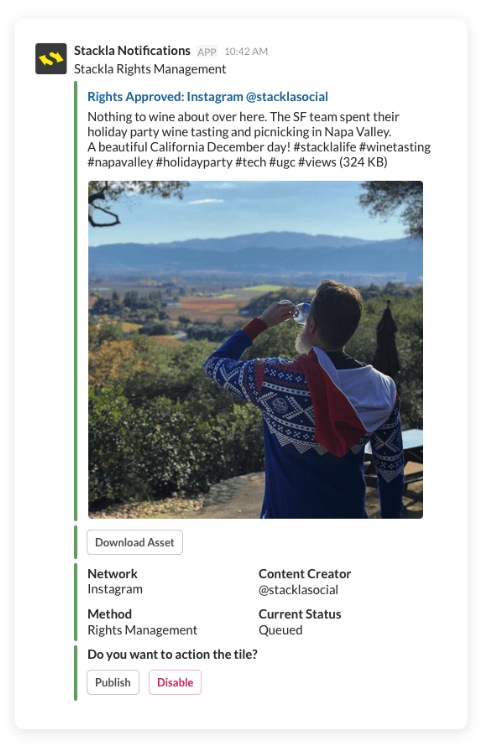 As part of our integration, you can download a high resolution version of that asset directly from the notification in Slack. We also allow you to configure your Stackla Slack notifications to include Publish, Queue and Disable buttons — meaning your Slack channel members can help moderate freshly approved content from directly within Slack. Our official Slack integration is now available to install from the Slack App Directory.